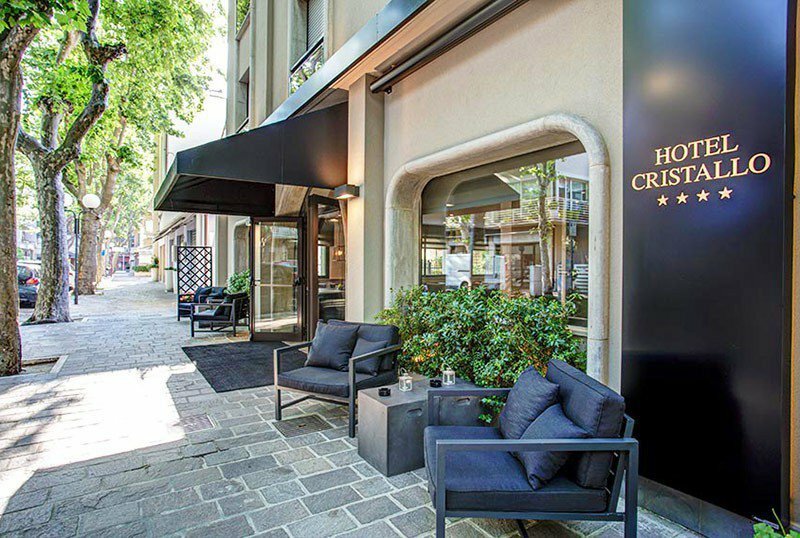 In the pedestrian area of Cattolica, Hotel Cristallo is an elegant 4-star annual hotel offering many services including indoor parking, air conditioning, WI-FI connection and the possibility to come on holiday with their 4-legged friends. In Cattolica near the sea, the hotel is located in the central area, just a few minutes from the dancing fountains of 1° May square, in the pedestrian part of the city. All have French balcony or window, telephone, safe, air conditioning, minibar, LCD satellite TV, WI-FI connection and private bathroom with shower and hairdryer. Three types of rooms are available: Comfort, Executive and Junior Suite. Panoramic sun terrace with 2 hydromassages, outdoor furnished area, free bicycles, lift, bar area, TV room, reading room, 24 hour reception, safe and laundry. PARKING: indoor and outdoor, available to all customers. Parking spaces available in the garage. AIR CONDITIONING: free and available throughout the entire hotel. PETS: pets of all sizes are allowed. A supplement is payable. LUNCH AND DINNER: every day dishes and recipes of the Romagna tradition. Guests can choose from different menus of meat and fish with fresh pasta and homemade desserts. In the hotel: strollers and bottle warmers. On request: baby-sitting service for a fee. At meals: high chairs at the table, baby food and dedicated menus. On the beach: playground, swimming pool with slide and entertainment. The hotel has an agreement with the Oasis de la Playa n. 68, equipped with beach umbrella and sun beds rental, heated salt water pool, Jacuzzi, children's playground area, entertainment, baby changing room, hot showers, free water dispenser, fitness area, beach volleyball, beach tennis and bocce. Full board rates are considered per day and per person. B & B rates are per room per day. News 2019: the restaurant is provided for a la carte at the "Terrazza sul mare" restaurant in Hotel Kursal **** Cattolica at 50 meters, with a breathtaking view from its table. Available treatments: B & B / Half Board / Full Board / All inclusive. Celebrate with us and enjoy the Easter and Holiday Bridges 2019! Offer in Formula All Inclusive starting from € 55.00 per person per day. New 2019: catering is scheduled a la carte at the restaurant "Terrazza sul mare" of Hotel Kursal **** Cattolica at 50 meters, all guests can enjoy the breathtaking view from their table. Promotions for children and families. The Hotel Cristallo is open all year round! Special rate for B&B € 49.00 for a double room and for just € 20 you can dine à la carte! SUMMER SPECIAL 2019 BOOK BEFORE 30TH APRIL! 10% discount on bookings confirmed before 04/30/2019, on all summer dates starting from € 60.00 per person per day in Full Board. conventions parks and much more!